Climate change and the alarming rate of biodiversity decline caused by rising temperatures worldwide are perhaps the most serious environmental challenges that society faces today. And it’s not just plants, birds and animals – humans are also already being affected, and the impact is only set to get worse. Especially in countries like the Netherlands, where more than a quarter of the land area is below sea level, urgent action is required to mitigate the effects of global warming. The Netherlands (especially the Wadden Sea) is also at an important crossroads for many migratory birds as they fly south from Europe to Africa during the winter. Vogelbescherming Nederland (VBN, BirdLife in the Netherlands) is working with the Dutch government and nature management organizations on a long-term nature-based National Adaptation Plan to do just that. Designed in the 1990s, the Dutch National Ecological Network (NEN) aims to span 750.000 hectares by 2027 (roughly 18% of the Netherlands and including national parks and Natura 2000 sites). In addition, more than six million hectares of waterscape – lakes, rivers, the Wadden Sea and part of the North Sea – will be protected. A network with robust connections and optimal conditions will, when current habitats become inhospitable, help species migrate to more favourable areas and climate zones to reduce the risk of extinctions. This ecological network will also help mitigate the effects of climate change through nature-based solutions like flood risk management, protecting biodiversity, improving air quality, sustainable energy production, and promoting healthy soils. Adaptation therefore means building strategies that increase the ability of ecosystems to adapt to climate change (resilience) and enable species and habitats to move into areas with more suitable climatic conditions (accommodation)…. Since 2006, the Climate Buffer Coalition – a coalition of Dutch nature organizations, including VBN – has delivered 20 habitat restoration projects funded by the Dutch government as part of the National Adaptation Plan. These climate buffers are areas where natural processes have been used to increase defence against flooding, as opposed to building sea walls and dykes that tend to damage natural habitats. Ground water levels in marshland areas were raised, resulting in reduced maintenance costs for Water Boards. Sea walls were strengthened not with basalt but by depending on morphological sand processes, creating new beaches and natural banks. Interventions such as these or the one in Groningen have not only increased the NEN network, but also provided new ‘climate-buffer’ habitats for several marshland birds, such as the White-Winged Tern, Whiskered Tern and Baillon’s Crake, resulting in an increase of their European breeding range. It has also benefited the local economy thanks to increased accessibility of the natural climate buffer areas, which has led to higher visitor numbers…. By Nicolette Hahn Niman —author of “Defending Beef: The Case for Sustainable Meat Production” (Chelsea Green), from which this is adapted. People who advocate eating less beef often argue that producing it hurts the environment. Cattle, we are told, have an outsize ecological footprint: They guzzle water, trample plants and soils, and consume precious grains that should be nourishing hungry humans. Lately, critics have blamed bovine burps, flatulence and even breath for climate change. As a longtime vegetarian and environmental lawyer, I once bought into these claims. But now, after more than a decade of living and working in the business—my husband, Bill, founded Niman Ranch but left the company in 2007, and we now have a grass-fed beef company—I’ve come to the opposite view. It isn’t just that the alarm over the environmental effects of beef are overstated. It’s that raising beef cattle, especially on grass, is an environmental gain for the planet. Let’s start with climate change. According to the Environmental Protection Agency, all of U.S. agriculture accounts for just 8% of our greenhouse emissions, with by far the largest share owing to soil management—that is, crop farming. A Union of Concerned Scientists report concluded that about 2% of U.S. greenhouse gases can be linked to cattle and that good management would diminish it further. The primary concern is methane, a potent greenhouse gas.But methane from cattle, now under vigorous study by agricultural colleges around the world, can be mitigated in several ways. Australian research shows that certain nutritional supplements can cut methane from cattle by half. Things as intuitive as good pasture management and as obscure as robust dung beetle populations have all been shown to reduce methane. At the same time, cattle are key to the world’s most promising strategy to counter global warming: restoring carbon to the soil. One-tenth of all human-caused carbon emissions since 1850 have come from soil, according to ecologist Richard Houghton of the Woods Hole Research Center. This is due to tillage, which releases carbon and strips the earth of protective vegetation, and to farming practices that fail to return nutrients and organic matter to the earth. Plant-covered land that is never plowed is ideal for recapturing carbon through photosynthesis and for holding it in stable forms. Most of the world’s beef cattle are raised on grass. Their pruning mouths stimulate vegetative growth as their trampling hoofs and digestive tracts foster seed germination and nutrient recycling. These beneficial disturbances, like those once caused by wild grazing herds, prevent the encroachment of woody shrubs and are necessary for the functioning of grassland ecosystems. Grass is also one of the best ways to generate and safeguard soil and to protect water. Grass blades shield soil from erosive wind and water, while its roots form a mat that holds soil and water in place. Soil experts have found that erosion rates from conventionally tilled agricultural fields average one to two orders of magnitude greater than erosion under native vegetation, such as what’s typically found on well-managed grazing lands. Nor are cattle voracious consumers of water. Some environmental critics of cattle assert that 2,500 gallons of water are required for every pound of beef. But this figure (or the even higher ones often cited by advocates of veganism) are based on the most water-intensive situations. Research at the University of California, Davis, shows that producing a typical pound of U.S. beef takes about 441 gallons of water per pound—only slightly more water than for a pound of rice—and beef is far more nutritious. Eating beef also stands accused of aggravating world hunger. This is ironic since a billion of the world’s poorest people depend on livestock. Most of the world’s cattle live on land that cannot be used for crop cultivation, and in the U.S., 85% of the land grazed by cattle cannot be farmed, according to the U.S. Beef Board. The bovine’s most striking attribute is that it can live on a simple diet of grass, which it forages for itself. And for protecting land, water, soil and climate, there is nothing better than dense grass. As we consider the long-term prospects for feeding the human race, cattle will rightly remain an essential element. …. To effectively scale up local knowledge coproduction, we need to foster a variety of knowledge-sharing and social-learning platforms, such as the interactive database of research networks to which we invite readers to contribute (rael.berkeley.edu/project/stakeholders-in-science). At the global scale, there is urgent need for the institutionalization of mechanisms of local knowledge mobilization, perhaps within the IPCC, to prevent continued fragmentation of coproduction initiatives. Whereas many networks we examine seek to do this, without a more systematic global means of knowledge integration and dialogue, their efforts will remain local or regional….Finally, transdisciplinary models of research collaboration have important policy implications, including the need for granting agencies to develop transdisciplinary research governance criteria (7) and for universities to revisit their proprietary policies and to develop rights of shared ownership of the knowledge coproduced…. N. L. Klenk, K. Meehan, S. L. Pinel, F. Mendez, P. T. Lima, D. M. Kammen. Stakeholders in climate science: Beyond lip service? The globally averaged temperature over land and ocean surfaces for October 2015 was the highest for October since record keeping began in 1880. This was also the highest departure from average for any month in the 1630 months of record keeping, surpassing the previous record set last month. The year-to-date (January-October) was also record warm. Separately, the October average temperature across global land surfaces was 1.33°C (2.39°F) above the 20th century average, the highest for October on record. This surpasses the previous record set in October 2011 by 0.17°C (0.31°F). This margin is larger than the uncertainty associated with the dataset. Large regions of Earth’s land surfaces were much warmer than average, according to the Land & Ocean Temperature Percentiles map above. Record warmth was observed across the entire southern half of Australia, part of southern and southeastern Asia, much of central and southern Africa, most of Central America and northern South America, and parts of western North America. This monthly summary, developed by scientists at NOAA’s National Centers for Environmental Information is part of the suite of climate services NOAA provides to government, business, academia and the public to support informed decision-making. Ancient climates on Earth may have been more sensitive to carbon dioxide than was previously thought, according to new research. Scientists examined nahcolite crystals found in Colorado’s Green River Formation, formed 50 million years old during a hothouse climate. They found that carbon dioxide levels during this time may have been as low as 680 parts per million (ppm), nearly half the 1,125 ppm predicted by previous experiments. The new data suggests that past predictions significantly underestimate the impact of greenhouse warming and that Earth’s climate may be more sensitive to increased carbon dioxide than was once thought. “The significance of this is that CO2 50 million years ago may not have been as high as we once thought it was, but the climate back then was significantly warmer than it is today,” said Lowenstein. CO2 levels in the atmosphere today have reached 400 ppm. According to current projections, doubling the CO2 will result in a rise in the global average temperature of 3 degrees Centigrade. This new research suggests that the effects of CO2 on global warming may be underestimated. “Take notice that carbon dioxide 50 million years ago may not have been as high as we once thought it was. We may reach that level in the next century, and so the climate change from that increase could be pretty severe, pretty dramatic. CO2 and other climate forcings may be more important for global warming than we realized.” The only direct measurement of carbon dioxide is from ice cores, which only go back less than 1 million years. Lowenstein and his team are trying to develop ways to estimate ancient carbon dioxide in the atmosphere using indirect proxies. He said that their approach is different than any ever undertaken. “These are direct chemical measurements that are based on equilibrium thermodynamics,” he said. “These are direct laboratory experiments, so I think they’re really reliable. The first data-driven estimate of the Earth’s total supply of groundwater shows that less than six per cent of groundwater in the upper two kilometers of the Earth’s landmass is renewable within a human lifetime….Groundwater: it’s one of the planet’s most exploited, most precious natural resources. It ranges in age from months to millions of years old. Around the world, there’s increasing demand to know how much we have and how long before it’s tapped out. For the first time since a back-of-the-envelope calculation of the global volume of groundwater was attempted in the 1970s, an international group of hydrologists has produced the first data-driven estimate of the Earth’s total supply of groundwater. The study, led by Dr. Tom Gleeson of the University of Victoria with co-authors at the University of Texas at Austin, the University of Calgary and the University of Göttingen, was published today in Nature Geoscience. The bigger part of the study is the “modern” groundwater story. The report shows that less than six per cent of groundwater in the upper two kilometres of the Earth’s landmass is renewable within a human lifetime. “This has never been known before,” says Gleeson. “We already know that water levels in lots of aquifers are dropping. We’re using our groundwater resources too fast–faster than they’re being renewed.” With the growing global demand for water–especially in light of climate change–this study provides important information to water managers and policy developers as well as scientists from fields such as hydrology, atmospheric science, geochemistry and oceanography to better manage groundwater resources in a sustainable way, he says…. Daniel Swain, a climate scientist at Stanford University, called the temperature reading significant. It is the highest such weekly temperature above the average in 25 years of modern record keeping in this key region of the Pacific Ocean west of Peru. “This is a very impressive number,” Swain said, adding that data suggest that this El Niño is still warming up. “It does look like it’s possible that there’s still additional warming” to come. “We’re definitely in the top tier of El Niño events,” Swain said. Temperatures in this key area of the Pacific Ocean rose to 5.4 degrees Fahrenheit above average for the week of Nov. 11. That exceeds the highest comparable reading for the most powerful El Niño on record, when temperatures rose 5 degrees Fahrenheit above the average the week of Thanksgiving in 1997. The 5.4 degree Fahrenheit recording above the average temperature is the highest such number since 1990 in this area of the Pacific Ocean, according to the National Weather Service. El Niño is a weather phenomenon involving a section of the Pacific Ocean west of Peru that warms up, causing alterations in the atmosphere that can cause dramatic changes in weather patterns globally. For the United States, El Niño can shift the winter track of storms that normally keeps the jungles of southern Mexico and Central America wet and moves them over California and the southern United States. The northern United States, like the Midwest and Northeast, typically see milder winters during El Niño. The National Weather Service’s Climate Prediction Center has already forecast a higher chance of a wet winter for almost all of California and the southern United States…. There are better odds that the area around Lake Oroville, California’s second-largest reservoir, will have above-normal precipitation — now more than a 40% chance, up from a more than 33% chance in last month’s forecast. San Francisco now has more than a 50% shot of a wetter-than-average winter, up from a more than 40% probability. Los Angeles continues to have more than a 60% probability of a wet winter during the months of January, February and March. Officials are scrambling to prepare, including clearing out basins and making sure roads are ready for all the rain. Not only are we getting closer to winter, but El Niño is maintaining its strength and even getting stronger, said Matthew Rosencrans, head of operations for the National Weather Service‘s Climate Prediction Center. “From the latest observation, it’s still on an upward trend,” he said, “not even topping out right now…. Why are scientists so confident that El Niño won’t suddenly disappear earlier than expected? The pool of warm water in the Pacific Ocean west of Peru is huge and very deep. “There’s been a tremendous distribution of heat, and that is definitely not going away” any time soon, said Bill Patzert, climatologist with NASA’s Jet Propulsion Laboratory in La Cañada Flintridge. “I’m quite optimistic that the entire state is going to get hosed. “This El Niño is so dramatically large. It’s so intense. It’s hard to imagine that it won’t deliver,” Patzert said. Actually, no, Patzert says. El Niño storms come straight from the west from an area of the Pacific Ocean north of Hawaii; November’s snowstorms originated from the Gulf of Alaska. That’s what brought very chilly weather and lots of snow to the resorts at Lake Tahoe. One single storm brought 20 inches of powder to Mammoth Mountain, cheering skiers and snowboarders. Yes, Patzert said. The drought in recent years has been worsened by a mass of high pressure deflecting typical winter storms that swoop into California from the Gulf of Alaska. That mass of high pressure generated warmer-than-normal ocean water in the northern Pacific, which became dubbed “the blob.” November’s snowstorms suggested that the drought-causing mass of high pressure “doesn’t seem to be playing the role it has been in the last few years,” Patzert said. “This is the earliest the ski resorts have been opened in many years. … They rarely open before Thanksgiving.” Especially important is that it has been cold. “For California ski resorts, snow is good but what really counts is temperature. So the key for Big Bear and Mammoth is that the temperatures are cold enough to make snow. And it has been cold,” Patzert said. Whether the cold snap lasts through spring is an open question. The Climate Prediction Center has forecast above-normal temperatures this winter for California. But what about the mountains that are important to the state’s water supply? No one has a good answer for this. The mid-elevation mountains of Northern California are very important to the state’s water supply, and it’s important that precipitation comes as snow, not rain. Too much rain all at once will force excess water to be flushed out to sea to prevent dams from being overwhelmed. But if snow falls, it can melt slowly in the spring and summer, gently replenishing reservoirs. Scientists generally agree that more precipitation is likely in these mid-elevation mountains. But whether it’ll fall as snow or rain isn’t known. What have El Niño winters brought to California in the past? A lot of rain, snow and devastation. Los Angeles in the 1997-98 season saw double the amount of rainfall, and the mountains of Northern California saw double the snowpack. The storms themselves were not particularly intense, but the problem was that there were so many of them and they came one after another at a relentless pace. Downtown Los Angeles in February 1998 saw nearly a year’s worth of rain in that single month. That winter, 17 people died in California, and more than half a billion dollars’ worth of damage occurred. Flood-control channels overflowed, mudslides destroyed hillside homes and roads, and railroad tracks were washed away. What isn’t expected in an El Niño? Patzert says Pineapple Express storms — the kind that come from south of Hawaii and bring excessive rain in a short amount of time — aren’t typically seen during an El Niño. “They’re the storms where you get 10 inches in 24 hours. The El Niño storms aren’t like that,” he said. An example of a Pineapple Express storm was the storm in 2010 that dumped rain at an alarming rate over the mountains that burned in the massive Station fire, unleashing a torrent of mud that inundated more than 40 houses in La Cañada Flintridge, Patzert said. Ocean waters west of Peru are now hotter than recorded in at least 25 years, surpassing the temperatures during the record 1997 El Niño. It is the highest such weekly temperature recorded in 25 years of modern record-keeping in this key region of the Pacific Ocean west of Peru. Temperatures in this key area of the Pacific Ocean rose to 5.4 degrees above average for the week of Nov. 11. That exceeds the highest comparable reading for the most powerful El Niño on record, when temperatures rose 5 degrees above the average the week of Thanksgiving in 1997. In fact, last week was the hottest this area of the Pacific Ocean has been since 1990, when records began being kept meticulously. It was 85.46 degrees as of Nov. 11, surpassing the 85.1-degree record hit a week before. Prior to that, the record high was 84.92 degrees set the week of Thanksgiving in 1997. As many as 50 percent of all natural history specimens held in the world’s museums could be wrongly named, according to a new study. Tiny plastic bits, collectively known as called microplastics, are showing up in bodies of water around the world, and are accumulating in aquatic creatures, including fish and shellfish. Now scientists, after testing a sampling of commercial products in China, have reported for the first time that they also could be contaminating something else we consume from the sea salt. Microplastics are defined as plastic particles smaller than 5 millimeters in size. They come from a variety of sources, including industrial waste, personal care products and plastic litter that degrade in the environment. What this pollution means for aquatic life and people who consume seafood isn’t clear, but experts have raised concerns about potential health effects. Some lab tests have shown nano-sized plastic fragments can enter cells and cause tissue damage…The researchers tested 15 brands of sea salts, lake salts, and rock and well salts from underground deposits purchased at Chinese supermarkets. The sea salts contained the highest concentrations of microplastics from 550 to 681 particles per kilogram. …If adults were to consume sea salt at the recommended nutritional level for the seasoning, they could potentially ingest 1,000 microplastic particles every year from that source. For the sake of comparison, another study has estimated that many Europeans consume about 11,000 of these particles every year by eating contaminated shellfish. Paleontologists find that tiny organisms called foraminifera have a big story to tell about the health of Puget Sound. Two recent studies about the health of Bellingham Bay and inlets in the Bremerton area found the diversity and number of foraminifera — single-celled marine organisms that live on the sea floor — deteriorated significantly…. Whether you’re territorial, a girlfriend stealer, or a cross dresser, when it comes to finding a partner, scientists have discovered that for some birds it’s all in the genes. Dowitchers are among the myriad shorebirds that depend on San Francisco Bay wetlands during migration and in winter. Like Song Sparrows in tidal marsh habitat, shorebird numbers and diversity increase when crucial feeding grounds are restored. Point Blue photo. It was pre-dawn, and the gate to the Oro Loma marsh in Hayward, California, was locked. Draped on the gatepost was a necklace of about ten U-locks, allowing multiple organizations to access the marsh. As Sierra to the Sea interns with Point Blue Conservation Science, Anna Kennedy and I had the key to one of them. We went to Oro Loma that morning to collect data on birds in the restored wetlands beyond the gate − to add to the understanding of changing marshes and the estuary as a whole. The 365-acre marsh in South San Francisco Bay was ecologically restored in November 1997 and is now part of the Hayward Regional Shoreline, a complex managed by East Bay Regional Park District. The levee holding back the bay was breached in two places, allowing tidal waters to once again flow over the landscape. Now, in place of the former industrial salt production ponds, tidal marsh habitat is nourished by the ebb and flow of water and nutrients of the San Francisco Estuary… I asked Point Blue ecologists about this and learned that this marsh has been undergoing treatment for invasive Spartina (cordgrass), as part of a recent bay-wide effort. While removal of the non-native plant is good for the marsh, it has caused a temporary loss of Marsh Wren habitat. When native Spartina and other native vegetation return, so will the wrens. This is another instance of ecosystem resilience linked to management practices by people. By measuring changes like these on much larger time and geographic scales, scientists can detect trends among marsh-reliant species and assess restoration success….The new Sierra to the Sea internship at Point Blue has a focus on climate-smart restoration, the growing practice of using science to help design ecological restoration that anticipates climate change. After surveying several marshes around the Bay, Anna and I went on to examine the impact of future sea-level rise on the same sites. We used an amazing online tool from Point Blue, called Future San Francisco Bay Tidal Marshes. This publicly available tool is a great example of a new focus on helping resource managers and other key stakeholders make smart decisions in preparation for the effects of climate change…..
(Washington, D.C., Nov. 18, 2015) Collisions with glass windows kill hundreds of millions of birds each year in the United States, but thanks to American Bird Conservancy’s new Bird-Smart Glass Program, a list of 18 tested, proven products is now available to help homeowners and architects identify simple but effective solutions to stop birds from hitting window…..18 products [were] found to be effective in significantly reducing bird collisions with glass. Six of these products are consumer materials meant for homeowners; 14 are commercial products for architects and building managers, and two of the products are appropriate for both settings. Melting glaciers are causing a loss of species diversity among benthos in the coastal waters off the Antarctic Peninsula, impacting an entire seafloor ecosystem. This has been verified in the course of repeated research dives, the results of which were recently published by experts from Argentina, Germany and Great Britain. A drunken forest in Siberia caused by melting permafrost. By Gayathri Vaidyanathan and ClimateWire | November 19, 2015 Scientific American, Climate Wire This is the second of a four-part series. Read the first part here. Using a metal rod, Baltzer, an ecologist with Wilfrid Laurier University in Waterloo, Ontario, pierced the ground near a spruce. “You are jamming into ice there,” she said. Without that freeze, the unstable spruce trees would entirely lose their footing and drown. Goose Lake is at the knife’s edge of climate change. Half a century ago, this region, which is 250 miles from the Arctic Circle, used to contain mostly permafrost, or perennially frozen ground. Today, the ground has partially thawed and the region is predominantly wetland. The rapid changes have been catalyzed by climate change, which has warmed these environs by 4 degrees Fahrenheit in the past half-century. Scientists worry that, as permafrost thaws, a portion of the carbon stored in the northernmost ecosystems will be released to the atmosphere and trigger runaway global warming. The biggest threat at present is posed not by the frozen tundras of the Arctic, but by the soils of the boreal—the southern reaches of the deep freeze in Canada, Alaska and other parts of the world—like at Goose Lake, where the permafrost is thin and sporadic, the soil temperature close to melting point, and the land already disturbed by oil and gas exploration…..
Last Monday, I went looking for death. Technically, I was on a biweekly wildlife survey of San Francisco’s Thornton Beach. I was tagging along with Kirsten Lindquist, head of Beach Watch, a shoreline monitoring program created by the Greater Farallones National Marine Sanctuary. As we neared the water, California and mew gulls stood on glistening wet sand and small flocks of sanderlings twisted and turned in unison over the crashing waves. There was no hint of doom, but in recent months this and many other Pacific Coast beaches have become sandy graveyards for thousands of common murres. “Two weeks ago, we found 80 dead murres here,” Lindquist said as we set off down the beach with another volunteer. “I have no idea what we’ll find today.” Common murres—black-and-white fish eaters sometimes mistaken for penguins—breed on the rocky cliffs of the Farallon Islands about 27 miles off the California coast. This past summer, beachcombers began reporting dead and weakened murres on shores from Northern California all the way up to the Gulf of Alaska. In September alone, Beach Watch volunteers found some 1,500 murre carcasses—six times the average, and four times the average during an El Niño, when more murres die (more on that below). As we followed the shoreline, our eyes scanning for sodden feathery bodies, Lindquist told me that murres aren’t the only marine animals in the region suffering declines of late. In fact, they’re the fourth Pacific Coast species to experience a mass mortality event in the past year. While these tropical guests may be enjoying their stay, the warm water—which is much less nutrient-rich than the cold water that typically wells up from the Pacific’s depths—can spell big trouble for some local species. Cassin’s auklets and common murres, for example, have suffered more than other seabirds. Auklets are among the few seabirds that feed exclusively on lipid-packed, cold-water-dwelling copepods and krill—tiny crustaceans that warm waters may have driven away or far too deep for auklets to find…. ….Adult murres undergo a “catastrophic molt” and their chicks can’t fly yet, so the birds must dive and swim for their food. Unfortunately, experts believe the warm water has caused the fish they eat to become more spottily distributed and may be forcing them into lower ocean depths—too deep for the molting adults and chicks to reach. (The layer of warm surface water off the Farallons in September extended to a depth of about 100 feet). “Birds that end up in a bad location with limited resources at this time of year [don’t have a chance],” says Jaime Jahncke, director of Point Blue’s California Current group and an expert in marine food-web dynamics. Scientists have long known that birds are feeling the heat due to climate change. However, a new study of a dozen affected species in the Western Cape suggests their decline is more complex than previously thought – and in some cases more serious. Snowpacks are a vital source of water for humans, but they may shrink in some regions as the climate warms. A new study estimates how changes in snowfall will affect water supplies. Justin S. Mankin, an earth scientist at Columbia University, and his colleagues analyzed 421 drainage basins in the Northern Hemisphere that depend on rainfall and snowmelt, and then combined the data with several different climate models. They found that 97 basins, currently serving two billion people, depend heavily on snowmelt. The scientists calculated that the likelihood the basins would receive less snow in the coming century was 67 percent. The most sensitive basins in the United States include those in Northern and Central California, and those of the Colorado and Rio Grande rivers. Internationally, the Atlas basin of Morocco and the Ebro-Duero basin, which feeds water to Portugal, Spain and southern France, are also particularly sensitive to change. Dr. Mankin and his colleagues reported their findings in the journal Environmental Research Letters…. Countries ‘may need to prepare for a world where the snow reservoir no longer exists,’ researchers say, highlighting the challenges of both too much water and not enough. As California enters its fifth year of severe drought, and as the state pumps more and more groundwater up to the surface, Central Valley farmers watch their fields literally sinking. They may not think they share much in common with rice growers in Bangladesh, or Sherpas in Tibet, but they are united by one common phenomenon: mountain snowmelt. In a study published in Environmental Research Letters on Thursday, a team led by Columbia postdoctoral fellow Dr. Justin Mankin predicts just how, and how much, regions around the world will feel the impact of changing snowmelt as global warming frequently turns snow into rain, especially along the globe’s major mountain chains. Snowpacks on peaks from the Rockies to the Himalayas provide water to vast basin regions, particularly in the Northern Hemisphere: the researchers looked at data from over 400 areas, but just 97 of those house more than a quarter of the world’s population. Those same 97 places have at least a two-thirds chance of losing water, thanks to changes in snowmelt…. SYDNEY, Australia — A fire that raged this week across hundreds of thousands of acres of grasslands and about-to-be harvested wheat crops, killing a farmer and three workers, points to a dangerous summer ahead in Australia, scientists and weather watchers say. he fire, in the south of Western Australia, began last weekend after lightning struck about 12 miles north of the township of Esperance. It was flaring six days later after burning through 580 square miles of farmland, fanned by temperatures above 100 degrees and bursts of wind gusting at more than 50 miles an hour. The combination of record heat and very dry conditions — October was the hottest month in Australia ever after its third-driest September — is prompting some officials to predict an especially intense fire season, which started early this year. “It is going to be a horror summer,” said Trevor Tasker, a firefighter and regional emergency services inspector from Western Australia. “I’ve never seen conditions like this.” A prolonged fire season could strain the largely volunteer firefighting forces in Australia and destroy crops, livestock and farms, many of which have suffered through decades of drought…. Historically when El Niño events occur, Hawai’i has experienced nearly six months of drought, from November to April. Conversely, during La Niña events rainfall has been greater than normal – building up Hawai’i’s groundwater supply. New research has determined that the relationship between La Niña and rainfall in Hawai’i has changed and recent La Niña years have brought less-than-normal rainfall…. This research was supported with funding from the S. D. Bechtel, Jr. Foundation. Streamline water rights: The state has an unusually complex seniority-based system of surface water rights, characterized by fragmented and unclear oversight authority. Bringing all surface water users under the State Water Board’s permitting system would enable more efficient and transparent real-time management of water, including water trading. It would also reduce uncertainty for all rights holders. Other reforms include clarifying rules on groundwater pumping in key at-risk groundwater basins and improving the state’s water accounting system. Clarify allocation of water for environmental uses: The drought has caused an environmental crisis for native fish and waterbirds, which was aggravated in some places by the relaxation of environmental standards to allow for an increase in water for cities and farms. The report proposes a process to support ecosystems and species. The State Water Board would assign an environmental water budget for each river and stream system, and local water users would develop procedures to meet and potentially modify these requirements. The report also recommends that the state encourage environmental water trading and that water users pay into an ecosystem fund when they benefit from a relaxation in environmental standards. Facilitate water trading: The volume of trading barely increased during the two most recent droughts, despite especially high demand from water users facing shortages. Several steps can be taken to reduce barriers to trading—including reforming the state’s complex and often opaque set of trading rules, and improving information needed to make trades easier. Flexibility can also be improved by consolidating permitting so that agencies in the same region no longer need multiple layers of review by multiple agencies each time they want to share water. Some types of temporary water transfers could be pre-authorized because they are unlikely to cause harm—for example, those below a specific size threshold. And a water transfer clearinghouse could make information about transactions and trading opportunities publicly available. “Implementing these reforms will require some adaptation. But it won’t require a complete overhaul of the state’s water rights system either,” said coauthor Brian Gray, an adjunct fellow at the PPIC Water Policy Center and professor emeritus of UC Hastings College of the Law. “Indeed, by increasing flexibility and transparency while also reducing uncertainty, these reforms should strengthen water rights and improve the ability to transfer water and invest in groundwater replenishment.” The report, Allocating California’s Water: Directions for Reform, was supported with funding from the S. D. Bechtel, Jr. Foundation. In addition to Hanak and Gray, the coauthors are Richard Frank, director of the UC Davis California Environmental Law and Policy Center; Richard Howitt, adjunct fellow at the PPIC Water Policy Center and professor emeritus of the UC Davis Center for Watershed Sciences; Jay Lund, adjunct fellow at the PPIC Water Policy Center and director of the UC Davis Center for Watershed Sciences; Leon Szeptycki, executive director of Water in the West at Stanford University; and Barton “Buzz” Thompson, director of the Woods Institute for the Environment at Stanford University. As California continues its longterm battle with droughts, perhaps it should look to another arid land for some advice. Flood irrigation wastes approximately half the water used to evaporation. According to a 2010 irrigation survey in California, flood irrigation accounted for 43% of irrigated land, including 78% of corn, 79% of grains, and 85% of sugar beet. In Israel, no farmer has used flood irrigation since the early 1970s. Drip irrigation is 90-95% water efficient and increases crop yield, but many farmers are put off by the cost of the equipment – especially because they think of their current source of water as being essentially free. In California, drip irrigation has been growing substantially since 1995 and now accounts for 39% of irrigated fields, but it is scarcely utilized in field crops, accounting for only 7% of corn. By contrast, in Israel, 75% of irrigated fields are utilizing drip irrigation. [The other 25% are sprinkler irrigated.] To spur adoption, both federal and state tax policy should encourage purchase of drip irrigation with tax credits or accelerated depreciation. In California only 13% of wastewater is reused, of which slightly more than one third, or 5% of the total amount of wastewater, is used for agricultural irrigation. Israel, though, reuses 86% of its wastewater (or treated sewage) for agriculture, accounting for over 60% of the water used in agriculture. Despite its 840-mile coast and history of severe droughts, California’s only operational seawater desalination plant produces a tiny 275,000 gallons a day. The largest desalination plant in the Western Hemisphere, producing over 50 million gallons per day, will shortly open soon in Carlsbad, CA. The plant has been built utilizing Israeli desalination company IDE’s desalination technology. As large as this plant is, when fully operational, it will still only account for about one-third of San Diego households’ freshwater needs. In the time it has taken to build this one plant in Carlsbad, Israel has built five giant seawater desalination plants producing over one quarter of the country’s water supply, mostly used for household water (equivalent to 80% of household water). California now has fifteen seawater desalination plants in the design or planning phase. The most notable of these is the Huntington Beach Desalination plant. IDE is also helping to restore the decommissioned Santa Barbara Charles E. Meyer desalination plant. But desalination plants are unpopular with legislators who have to pay for them and environmentalists who dislike the energy needed to run them. The process is slow and will put California at risk of shortages until the plants are completed. Israel began breeding seeds in the early 1950s to thrive on otherwise useless brackish water and now has a large agricultural export industry tied to it. Today, Israel produces California has inland supplies of brackish water that are not used and that can support a parallel agricultural industry to the thriving one California enjoys today. A dual-flush toilet can save almost half on most flushes reducing the total household consumption for flushing toilets from 35% of household water use to 20%. In 2000, Israel made the installation of dual-flush toilets compulsory. The Israel Water Authority estimates that this has saved 1,700 gallons per person per year, a large amount when multiplied by millions of people. From nursery school onward, Israelis are taught the importance of conservation. People are taught to use all of the water they need but not to waste. This becomes part of Israelis life philosophy and when they need to use water, they are efficient in its use. This should be added to the California curriculum. California has over 400 water districts, each creating water policy and pricing guidelines. This crazy quilt approach assures Californians of an inability to create a coherent, unified long-term water plan. Israel unifies all water decision making in the hands of a technocratic, apolitical water authority to achieve the best outcomes for the people of Israel – with excellent results. Perhaps the worst long-term implication of California’s water policies is the effect on aquifers and the environment. California farmers have long been able to drill into aquifers without regulation on how much water they are removing. This has created a dire situation in which many aquifers are dangerously low. According to Jay Famiglietti, a NASA scientist and leading authority on aquifers, “data from NASA satellites show that the total amount of water stored in the Sacramento and San Joaquin river basins… was 34 million acre-feet below normal in 2014. That loss is nearly 1.5 times the capacity of Lake Mead, America’s largest reservoir.” In Israel, the environment and the aquifers, rivers and the nation’s largest lake are all considered stakeholders in the country’s water future. The environment must be taken into account. Because it is easy for cash-strapped municipalities to defer repairs on water infrastructure, many pipes crack and leak. In some parts of California, leaks exceed 30% of all of the system’s water. It is urgent that infrastructure be taken into account and that we utilize water and sewage fees to repair and replace failing pipes. In Israel, 100% of all water and sewage fees must be spent on water. As such, the country has a loss factor to failing infrastructure of less than 10%, among the lowest in the world. We don’t know for sure whether the El Niño we face this winter will be a drought buster or a bust. But we had better prepare for a lot of rain and the potential flooding, landslides and disruptions we know especially heavy winter storms can bring to California. At the same time, we need to look past the coming. El Niño at the long-term changes in our weather patterns, as climate change poses new challenges to water managers, planners, utilities and, indeed, all of us. For the last century, California has had two key strategies for dealing with its winter wet season: Build big reservoirs on the rivers draining the Sierra Nevada to capture and store seasonal runoff and floodwater, and rely on mountain snowpack to build up in the winter and melt slowly over the spring and early summer. That approach brought great benefits to us and helped tame California’s naturally variable weather. Every year, hundreds of billions of gallons of storm water wash into Santa Monica Bay, Long Beach Harbor and the San Francisco Bay. But the era of big dams is over. We’ve built on all the decent dam sites (and some not-so-decent ones), federal money for Western water projects has dried up and the environmental damage caused by dams is now better known. As a result, it is unlikely that more than one or two new big dams will be built in California, and they would do little to expand the amount of water we can actually use. As for the snowpack, despite El Niño’s potential to drop a lot of snow in the Sierra, as the climate warms, future snowpack will be smaller and it will melt faster, putting more strain on our water supply. California’s water problems require a multitude of responses. We must reduce inefficiency and waste, and we must find new sources of water. One important approach is to improve our ability to capture, treat and use urban storm water, especially in the Los Angeles and San Francisco Bay areas…. As we have paved our cities, covering the land with impervious concrete and asphalt, less and less rain is recharging urban groundwater; it’s running off all those hard surfaces into storm sewers and out to the ocean. Every year, hundreds of billions of gallons of storm water wash into Santa Monica Bay, Long Beach Harbor and the San Francisco Bay. Even one inch of rain in Los Angeles can generate more than 10 billion gallons of runoff. It’s possible to capture quite a bit of that water. We will have to repave streets and parking lots with porous materials so that rain can percolate into the ground and recharge aquifers. Parks, open spaces and urban watersheds must be reconfigured with the same goal in mind. And homeowners need incentives to capture rainfall too, for use on their gardens and landscapes. The Water Replenishment District of Southern California, which manages groundwater in Los Angeles County, has identified thousands of acres where capturing storm water for groundwater recharge is possible. This could provide tens of thousands of acre-feet of “new” water for the L.A. Basin, reducing the region’s dependence on increasingly scarce and unreliable imported water. There are specific projects that cities everywhere are undertaking to better manage storm water. In Chicago’s Green Alley program, porous concrete allows storm water to drain into the ground, reducing sewer overflows and minimizing local flooding. Philadelphia businesses have installed roof gardens that absorb as much as half the rain that falls on them; the businesses get a tax credit that helps cover part of the cost. Locally, the L.A. County Flood Control District, the Department of Water and Power, the nonprofit group TreePeople and the Bureau of Sanitation have launched a pilot program that will retrofit 10 homes with rain-capturing roofs, water storage cisterns and specially designed rain gardens to take full advantage of whatever precipitation falls. A 2014 study by the Pacific Institute and the Natural Resources Defense Council estimated that storm water capture in urbanized Southern California and the San Francisco Bay region could increase California’s water supplies overall by 420,000 to 630,000 acre-feet per year — as much water as is used annually by the city of Los Angeles — while also reducing pollution flowing into the oceans. There is no single solution to California’s water challenges. In the face of unavoidable climate changes and growing competition for limited water, the best strategies will be those that improve the state’s water resilience on many fronts. More emphasis on local efforts that capture water through permeable hardscape, new local ordinances, homeowner incentives and smart infrastructure can help us take advantage of the times when it rains and when it pours. While media attention focused on the Legislature’s debate about long-term (post-2020) greenhouse gas reduction targets, California made important advancements in climate adaptation planning with less fanfare. Three climate adaptation-related bills were signed into law and the California Natural Resources Agency (CNRA) partnered with other agencies to prepare the Draft Implementation Action Plans for the state’s climate resilience strategy. If you are interested in climate adaptation planning, these are important new developments. Please see the summary of each [here], including helpful hyperlinks. SB 379 establishes the first statutory mandate to address climate adaptation in local general plans. It adds provisions to Government Code Section 65302 that require the safety element to be “reviewed and updated as necessary to address climate adaptation and resiliency strategies applicable to the city or county.” The update shall include: a vulnerability assessment; adaptation and resilience goals, policies, and objectives; feasible implementation measures; and reference to or attachment of a separate adaptation plan, if it fulfills these requirements. The deadlines for the safety element update provide lead time to cities and counties. The update is due at the time of a jurisdiction’s first FEMA Local Hazard Mitigation Plan adopted after January 1, 2017, or if no such FEMA plan has been adopted, after January 1, 2022. The bill also references specific sources of useful climate information to consult, such as Cal-Adapt. Two other bills signed into law will help California pursue better coordinated efforts to address climate change impacts. SB 246 establishes the Integrated Climate Adaptation and Resiliency Program and calls for the Office of Emergency Services, Office of Planning and Research, and CNRA to coordinate when updating the state’s adaptation strategy report and the Local Adaptation Planning Guide. AB 1482 requires CNRA to update the state’s resilience strategy in coordination with other relevant agencies to meet objectives pertaining to climate vulnerabilities. It also directs the Strategic Growth Council to coordinate existing grant programs that address climate change and adaptation across state and local agencies. Together, AB 1482 and SB 246 will help strengthen state and local planning and coordination to better cope with climate change effects. The European Urban Green Infrastructure Conference, the biggest annual event on urban green infrastructure and organised by GREEN4CITIES and Living Roofs Enterprises, will take place from 23 – 24 November 2015, in Vienna (Austria). The event will bring together Europe’s leading policy makers, urban planners, developers, contractors, city architects, builders, manufacturers, community groups, utility companies and NGOs. Download the programme for a preview of its diverse sessions, designed to optimise open discussion and exchange…. When you think about the most important actions we can take to fight climate change, you probably think of using your car less (or even getting rid of your car), reducing energy use in your home, or even supporting the development of cleaner forms of energy like solar and wind. While all of these things are important when it comes to reducing the release of dangerous carbon pollution that is causing climate change, one of the most overlooked solutions is lying right below our feet—soil! [NRDC’s] new Climate-Ready Soil report finds that by using cover crops to build soil health on just half of the corn and soybean acres planted in the top 10 agriculture states, we can help to capture more than 19 million metric tons of carbon each year—that’s the same as removing 4 million cars off the road! In addition, using cover crops and other soil stewardship practices (like applying compost or using no-till farming) to improve organic matter in soil can help capture an additional trillion gallons of water—that’s enough water to meet the needs of nearly 33 million people every year. By improving the health of their soil, farmers also can reduce their vulnerability to future flood and drought events. Extreme weather events—life-threatening heat waves, heavy rainfall, torrential flooding and unforgiving drought—have become increasingly common throughout the country. In recent years, farmers in states like Texas and Oklahoma, to name just a few, have been devastated by both scorching drought and heavy downpours that have either damaged crops or left fields unfit for planting. And worse still, climate change will make many of these extreme weather events more frequent and more severe. Fortunately, farmers can help fight climate change by planting cover crops on their farms to improve the health of their soil. As winners of our recent Voices of the Soil Contest can attest, healthy soil is critical for supporting robust, resilient and sustainable farms. Soil that is stabilized with living roots throughout the year and left undisturbed by plows is teeming with microbes, fungi, earthworms, and other living things. These organisms help to supply growing plants with nutrients and water, and cover crops can play a pivotal role in fostering this healthy soil ecosystem. http://www.nrdc.org/water/climate-ready-soil.asp. In Washington state, a circulating petition might be the key to both permanently cutting down on the state’s carbon footprint and also reforming what is widely considered one of the nation’s most regressive tax systems. If enough signatures are secured, the petition will allow the United States’ first-ever carbon tax a spot on the ballot. Carbon Washington is a grassroots carbon tax campaign founded by environmental economist and stand-up comedian Yoram Bauman. The idea of a carbon tax is pretty simple: It’s a form of carbon pricing that aims to drive greenhouse gas emissions down by requiring people to pay a tax or a fee on either the carbon they emit or the fossil fuels they purchase, and then either returning the revenue to the public or using it for new government programs (Washington state would do the former). Carbon Washington’s initiative proposes a starting fee of $15 per ton of carbon, which would gradually increase to a cap of $100 per ton over the next 40 years — the highest price-per-ton of any carbon pricing scheme introduced so far. I think it’s a relatively new idea for a lot of people,” said Bauman. “When you talk about climate change, they think they’re going to have to spend money on solar panels or stuff like that.” But the idea is catching on. Washington requires citizens’ initiatives to raise 246,372 signatures via petition to qualify for the ballot. So far, Carbon Washington has raised 304,000 signatures, according to Bauman, and is hoping to reach 330,000 before it submits the petition at the end of the year to have a buffer of about 25 percent of the needed number of signers. Once we qualify, it goes to the legislature in January, and the legislature essentially has two choices,” Bauman said. “Pass it and it goes to law, or it goes on the ballot in 2016.” Washington state isn’t the only one. Citizens and legislators in a handful of other states around the country, including Massachusetts, Vermont, Rhode Island and Oregon, are in various stages of introducing similar proposals to their own state legislatures. In a landmark victory for climate activists, the Portland, Oregon city council voted yesterday to pass a resolution that opposes any new infrastructure that would transport or store fossil fuels within the city or its adjacent waterways. The vote, which was unanimous, comes a week after the city council voted to adopt a similar policy opposing any proposed rail projects that would carry crude oil through the city of Portland or Vancouver. Together, the resolutions constitute what environmentalists are calling the strongest city-supported opposition to fossil fuels in the country. “We seem to be reaching some sort of tipping point where people are waking up and realizing the enormity of the issue,” Adriana Voss-Andreae, director of 350PDX, told ThinkProgress. “That we got a unanimous vote was jaw-dropping. It was an inspiring moment for all of us.” While Portland cannot, due to interstate commerce laws, unilaterally ban fossil fuels from being shipped via rail, road, or water, it can enact local laws that limit the transportation and storage of fossil fuels within the city itself, especially if those laws are based in environmental or safety concerns. That’s largely the goal of this resolution — to codify into law things like zoning restrictions or restrictions on materials that would make shipping and transporting fossil fuels through Portland either prohibitively expensive, or too time consuming, for fossil fuel companies…. Drivers in one Canadian city will soon be getting a dose of climate reality when they go to the gas station. The city of North Vancouver, British Columbia passed a law this week that mandates climate change warning stickers be applied to gas pumps in the city. The vote makes the city the first in the world to implement such a law. The City Council still has to approve designs for the stickers, but a city staff report recommended including messages such as “Get $5,000 toward a purchase of a new electric car” or “Idling your vehicle for more than 10 seconds wastes more gas than restarting your engine” on the stickers. “The message is that burning fossil fuels causes climate change and … to add a positive spin, here are some tips when using your automobile on how to make it more fuel efficient,” North Vancouver Mayor Darrell Mussatto told the CBC. The effort to get the stickers on gas pumps is being spearheaded by a Toronto-based group called Our Horizon. Rob Shirkey, executive director of the group, told ThinkProgress that the main point of the stickers isn’t to get people to completely stop driving — it’s to change their way of thinking about climate change. While Europe is on high alert against another murderous terrorist attack, it will be hard for Paris to look beyond the next 24 hours. But soon delegates start arriving in the French capital for preliminary meetings ahead of COP21, the United Nations climate change summit which will be launched on 30 November with all the grandeur attendant on a gathering of global leaders. There is a certain symmetry to the two events that goes beyond the nightmare task facing France’s overstretched security forces. As the UK foreign secretary Philip Hammond pointed out in an important speech in the US only days before the Paris attacks last Friday: “Unchecked climate change … could have catastrophic consequences – a rise in global temperatures … leading in turn to rising sea levels and huge movements of people fueling conflict and instability.” There are reasons to be optimistic about a useful outcome from these negotiations, not least the determination of President Barack Obama’s team to deliver a deal with some kind of legal force. But any deal will mark the start rather than the end of the process. The world has learned from previous failures. The innovation of asking every country for its own intended nationally determined contributions in advance of COP21 is that they reduce the wriggle room, at least for the time being. Wednesday’s big speech from the UK energy secretary Amber Rudd, setting a cut-off date of 2025 for coal-fired power stations, will underline that sense of commitment and should help to build some momentum ahead of the talks, even though it is only a small advance on the policies she inherited. It is also a necessary reaffirmation of the Conservatives’ pledge to green the electricity supply which had begun to seem questionable after its widely criticised decision to end subsidies to wind and solar power unexpectedly early…. A series of events linked to a UN climate summit in Paris in two weeks will be cancelled over security fears, Manuel Valls told local radio on Monday morning.The conference will be “reduced to the negotiation” with “concerts and festive events” likely to be called off in the wake of the country’s worst ever terrorist attack, the country’s prime minister told RTL. Valls did not specify whether that included a mass demonstration planned by activists on the eve of the summit on 29 November. Despite the attack, no country or head of state had asked France to postpone the summit, he added. More than 100 world leaders are due to open the COP21 negotiations on Monday 30 November, at Le Bourget airport on the outskirts of the city. Organisers are expecting over 40,000 delegates a a day at the critical conference, where a global warming pact is to be finalised. 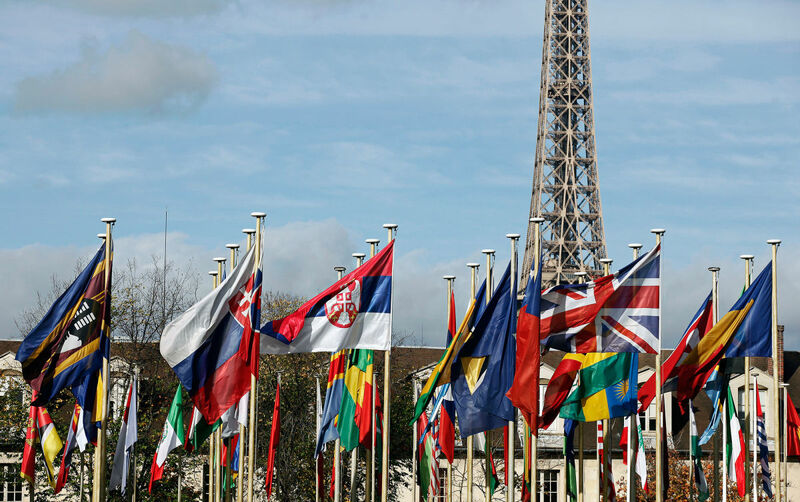 In parallel, several civil society and business groups had planned side events around Paris. President Francois Hollande declared a state of emergency after 129 people were killed and more than 350 injured in attacks on cafes, restaurants, a concert hall and a stadium on Friday evening. Laurent Fabius, foreign minister, promised “enhanced security” and said it was “absolutely essential” the talks went ahead. French officials are meeting this morning to define the security response, a spokesperson told Climate Home by phone. Organisers from 130 NGOs had expected to draw 200,000 people to a march to spur leaders to take strong action to counter climate change. The coalition organising the Global Climate March will meet at 1400GMT on Monday to discuss how best to proceed, Reuters reported on Sunday. After a concerted push from the United States, members of the Organization for Economic Cooperation and Development agreed Tuesday to slash subsidies aimed at exporting technology for coal-fired power plants. The decision by the world’s wealthiest countries to eliminate export credits for the least efficient coal plants, which will take effect Jan. 1, 2017, and can be strengthened four years later, marks a major negotiating success for the Obama administration in the run-up to U.N. climate talks later this month. The U.S. and several other key global players–including France, the World Bank, the European Investment Bank and the European Bank for Reconstruction and Development–have already limited its export financing for coal plants and had been pressing other nations, including Japan and South Korea, to follow suit. A senior administration official, who briefed reporters about the agreement reached in Paris on the condition of anonymity, said that under the new rules OECD countries would still provide export credits for coal plants using ultra-supercritical technology and help finance slightly less-efficient plants in the world’s poorest countries. But the policy would effectively cut off public financing for 85 percent of coal plants currently in the pipeline, he said. Jake Schmidt, who directs the international program at the Natural Resources Defense Council, estimated that these export agencies typically fund between five and seven coal plants a year. A large number of private banks follow the OECD guidelines for their own lending practices, he added, so the move could have “a ripple effect.”…. Friday’s terrorist attacks have made the Paris climate talks “even more” important now, according to Christiana Figueres, head of the UN Framework Convention on Climate Change (UNFCCC). And on Sunday, Democratic candidate Bernie Sanders elaborated on why climate change remains “the biggest national security threat facing the United States,” after remarks he made in Saturday’s Democratic debate were criticized by people who apparently don’t understand the existential nature the climate threat poses to this country and the world. What kind of security will Americans have if the Paris climate talks fail and we turn much of the U.S., Mexico and Central America into a near-permanent Dust Bowl, as NASA warned in February? “Sorry, conservatives: when President Obama describes climate change as the greatest threat we face, he’s exactly right,” as Paul Krugman explains in his latest New York Times op-ed. “Terrorism can’t and won’t destroy our civilization, but global warming could and might.” Both the UN and France have made clear that Friday’s despicable terrorist attacks won’t deter the big Paris climate talks that start in two weeks, as we’ve reported. Security will be much tighter. Ancillary marches and festivities will be pared back. And that means the focus will be on the global negotiations, which offer the world the first serious chance at getting off a path of unrestricted carbon pollution that would indeed destroy modern civilization as we know it. The civilized world stands in solidarity with the French after this senseless slaughter, much as it did after the Charlie Hebdo shootings earlier this year. Success at COP21 (the 21st Conference of Parties to the UNFCCC) is thus even more important for the world, as Figueres tweeted Sunday: The nations of the world must work together to address the biggest threat to our security. Yes, terrorism and the Islamic State (ISIS) are grave threats. But if COP21 were to fail, then conflicts like the Syrian civil war will become more common, along with disasters that war helped spawn, including ISIS and the refugee crisis. “In fact, climate change is directly related to the growth of terrorism,” Bernie Sanders said during Saturday’s debate. “And if we do not get our act together and listen to what the scientists say you’re going to see countries all over the world — this is what the CIA says — they’re going to be struggling over limited amounts of water, limited amounts of land to grow their crops. And you’re going to see all kinds of international conflict.”…. The White House issued a veto threat on Tuesday for a resolution from the Republican-led U.S. Senate that would nullify new regulations to cut carbon emissions from power plants, the central piece of President Barack Obama’s climate plan. The Senate sponsors of the motion have said the Environmental Protection Agency regulation, which is also being challenged in U.S. federal court by 26 states and more than a dozen industry groups, would hurt jobs in coal-dependent regions. Late on Tuesday, the Senate passed, 52-46, the measure challenging the administration’s plan to cut emissions from existing power plants. It also passed, in an identical vote, a similar resolution that the White House has threatened to veto dealing with new coal power plants. The White House said the Senate resolution “threatens the health and economic welfare of future generations by blocking important standards to reduce carbon pollution from the power sector” and said Obama would veto the bill. Calling on US bird lovers! is at risk of being nullified. Should the Ministry of Environment and Climate Change use it regulatory powers, Ontario could become a leader in bird conservation. Millions of birds die in Ontario from window collisions. Ontario’s Boreal Forest is a breeding ground for songbirds. Please add your voice! For more info, FLAP action alert. Global energy demand from developed nations has an adverse impact on freshwater resources in less developed nations according to a new study. While current energy policy focuses on preventing greenhouse gas emissions, the results show that freshwater impacts also need to be considered when deciding future national and international energy policies. Ta Quang Nah is a Vietnamese rice farmer, pig breeder, builder and fisherman. But for several months now he has also been running a power station from his home on the Ca Mau peninsula. All the family’s waste goes straight from their outdoor latrine to join that of their four pigs in an airtight underground chamber, and the methane gas that is naturally let off as the combined excreta decomposes collects in a long polythene bag secured above ground. Ta Quang Nah was advised by Oxfam how to set up his family biodigester, and when I met him last month he was proudly cooking on his own gas, and saving money by not buying wood or charcoal. His simple operation cost less than $50 to instal, paid itself off in a few months, needs little maintenance and is more than big enough for his family’s needs. Dozens of his neighbours want one too. Using vegetable or livestock waste to generate biogas is now common and growing fast as cattle farmers and food companies in Europe and the US are encouraged with subsidies to set up anaerobic, or airless, digesters like Ta Quang Nah’s rudimentary one. But using human waste is still largely taboo outside Asia. The UN university has calculated that biogas from human waste would have a value of $9.5bn a year In Europe and the US human waste is seen as a major health risk, but to generations of Chinese and Vietnamese farmers accustomed to handling organic manures “night soil” – as it is known – is a safe, desirable, organic fertiliser high in phosphorous, nitrogen and nutrients. Treated properly, it’s safe, commands premium prices and restores goodness to overworked fields…..
What will happen to our coastline with sea level rise, and how will it impact your community? You can help answer these questions through snapping photos during California’s “King Tides”–the highest tides of the year. King Tides dates this season are November 24-26, December 22-24 and January 21-22. Get out during a King Tides event and take pictures of your favorite coastal spots. Make sure to share them with the California King Tides Project! Check out events on http://california.kingtides.net/. National Living Shorelines Summit December 1-2, 2015 in Hartford CN. The Local Government Commission and the State of California are proud to host the second California Adaptation Forum in the Fall of 2016. The two-day event will be the premiere convening for a multi-disciplinary group of 1,000+ decision-makers, leaders and advocates to discuss, debate and consider how we can most effectively respond to the impacts of climate change. Point Blue: Coastal Adaptation Program Leader—Help save the world!! The Coastal Adaptation Program Leader (CAPL) will be responsible for executing the strategy and achieving the outcomes of Point Blue’s Protecting Our Shorelines Initiative. As such, the CAPL will help natural resource managers and policy makers advance their adaptation efforts in the face of accelerating climate change, ocean acidification, increased storm frequency and intensity, habitat loss, and other stressors, leveraging Point Blue and partner scientific, data, and informatics resources. The CAPL will also develop science-based policy and natural resource management recommendations. Learn more and how to apply here. For other jobs at Point Blue, see here. The California Natural Resources Agency and the Ocean Protection Council seek to hire a Coastal Program Analyst I or II. The ideal candidate will be willing and able to work on the wide variety of issues under the responsibility of the Ocean Protection Council. Please see the Ocean Protection Council’s website and 2012-2017 Strategic Plan for more information on the activities of the Council. Applicants must be eligible for hire from the Coastal Program Analyst I or II lists. Applications will be considered on a continuous basis; therefore, interested applicants are encouraged to submit their application as soon as possible. For more information, please visit: https://www.jobs.ca.gov/ and choose “Resources Agency” in the search function under “Department”. Please note that a Statement of Qualifications is required in addition to an Employment Application (STD 678) and resume. Audubon California is seeking an experienced and entrepreneurial conservation leader to carry out Audubon’s mission at the Richardson Bay Audubon Center & Sanctuary (RBACS). In partnership with the Director of Bird Conservation, Marine Program Director, and other Audubon California staff, the San Francisco Bay Program Director will be responsible for executing the mission of the National Audubon Society throughout San Francisco Bay. This position offers the chance to protect globally significant Important Bird Areas and to address proximate and long-term threats to waterbirds and forage fish species. More information and application are attached or can be accessed by the link below. The application is due December 14. The California Sea Grant College Program is now seeking applications for the 2017 NOAA Sea Grant John A. Knauss Marine Policy Fellowship. The Knauss Fellowship, established in 1979, provides a unique educational experience to graduate students who have an interest in ocean and coastal resources and in the national policy decisions affecting those resources. The program, which is sponsored by the National Oceanic and Atmospheric Administration’s (NOAA) National Sea Grant College Program, matches highly qualified graduate students with hosts in the legislative or executive branch of the government in the Washington, D.C. area for a one-year paid fellowship to learn about marine policy. California applicants may apply through either the California Sea Grant Program in La Jolla, or through the University of Southern California Sea Grant Program in Los Angeles. Other interested students should discuss this fellowship with their State Sea Grant Program or Project Director. As part of President Obama’s Climate Action Plan and the National Fish, Wildlife & Plants Climate Adaptation Strategy, an interagency group of federal, state, and tribal agencies today announced creation of a new Climate Adaptation Leadership Award for Natural Resources. The Award will recognize the actions of individuals and organizations that are making a difference by increasing understanding of climate impacts, adapting to and reducing threats, increasing response capabilities, and providing other innovative approaches to reducing impacts and increasing resilience in a changing climate. It will help spotlight innovative tools and actions that are making a difference now, and serve as a source of inspiration for additional efforts that advance climate smart resource conservation and management. “Our climate is changing, and these changes are already affecting the nation’s valuable wildlife and natural resources,” said Michael Bean, Principal Deputy Assistant Secretary of the Interior for Fish and Wildlife and Parks. “This new Award recognizes outstanding leadership by organizations and individuals that is critical to help advance the resilience of our natural resources and the people, communities, and economies that depend on them.” Establishment of the Climate Adaptation Leadership Award for Natural Resources was one of the commitments announced as part of the Administration’s Priority Agenda for Enhancing the Climate Resilience of America’s Natural Resources in 2014.The agenda calls for a commitment across the federal government to support resilience of America’s vital natural resources. The Islamic State is no mere collection of psychopaths. It is a religious group with carefully considered beliefs, among them that it is a key agent of the coming apocalypse. Here’s what that means for its strategy—and for how to stop it…. Texas’ education officials rejected allowing university experts fact-check textbooks approved for the state’s 5.2 million public-school students. Top Texas education officials rejected Wednesday letting university experts fact-check textbooks approved for use in public-school classrooms statewide, instead reaffirming a vetting system that has helped spark years of ideological battles over how potentially thorny lessons in history and science are taught. The Board of Education approves textbooks in the nation’s second-largest state and stood by its vetting process — despite a Houston-area mother recently complaining that a world geography book used by her son’s ninth grade class referred to African slaves as “workers.” The publisher, McGraw-Hill Education, apologized and moved to make immediate edits. Republican board member Thomas Ratliff had proposed bringing in academics to check textbooks only for factual errors, but his measure failed 8-7 after lengthy discussion….. Ever wonder why that diet didn’t work? A new study tracking the blood sugar levels of 800 people over a week suggests that even if we all ate the same meal, how it’s metabolized would differ from one person to another. The findings demonstrate the power of personalized nutrition in helping people identify which foods can help or hinder their health goals. Climate change will have a bigger impact on your family than the internet has had. Imagine if you knew a quarter-century ago how information technology and the internet were going to revolutionize so many aspects of life. Imagine how valuable that knowledge would have been to you and your family. We have such advanced knowledge of how climate change will play out over the next quarter-century and beyond. Those who have that knowledge will do vastly better in the world that humanity is remaking than those who do not. My new book “Climate change: What Everyone Needs To Know” provides you with that knowledge in a highly readable fashion. It is entirely in Q&A format, part of the Oxford University Press series of primers with that subtitle….Carbon dioxide (CO2) has a direct and negative impact on human cognition and decision-making. As readers know from a recent post, these impacts have been observed at CO2 levels that most Americans — and their children — are routinely exposed to today inside classrooms, offices, homes, planes, and cars. And that is something everyone needs to know — regardless of their politics. You also need to know about accelerating sea level rise if your family owns or plans to own coastal property — … Similarly, you need to know about climate change if you or a family member is planning to retire someplace currently warm and desirable. Carbon pollution is poised to make such places hot and undesirable. …You need to know about climate policy since it is making certain investments riskier than others. … The more you know about climate change, the more likely you are to make the best investments. Under different circumstances, you might not have needed to become knowledgeable about climate change. Policymakers should have listened to the teams of scientists they assembled a quarter century ago to inform them on the science. A truly global effort to cut carbon pollution should have begun a long time ago to avoid dangerous impacts. That didn’t happen. In fact, major fossil fuel companies like Exxon actually knew the climate science decades ago, but instead of educating the public and joining in the calls for action, Exxon helped launch what has turned into the biggest disinformation campaign in world history. s a result, climate change is an existential issue for humanity, one that has already touched you and your family — and whose impacts are speeding up. So you need to know about climate change because who else is going to make key life-changing decision for you and your family, decisions will that will increasingly depend on such knowledge? “Climate Change: What Everyone Needs to Know,” is available from Amazon in kindle and paperback. In recent years, wildfires have burned trees and homes to the ground across many states in the western U.S., but the ground itself has not gotten away unscathed. Wildfires, which are on the rise throughout the west as a result of prolonged drought and climate change, can alter soil properties and make it more vulnerable to erosion. A new study shows that the increase in wildfires may double soil erosion in some western U.S. states by 2050, and all that dirt ends up in streams, clogging creeks and degrading water quality. “It’s a pretty dramatic increase in sediment [entering streams],” write United States Geological Survey (USGS) geologist Joel Sankey and his colleagues, who will speak on the subject on Wednesday, 4 November, at the meeting of the Geological Society of America in Baltimore, Maryland. “The sediment can have a wide range of effects on a lot of watersheds, many of which are headwater streams and important for water supply in the West.” Wildfires whipping across a landscape can burn away ground cover and vegetation, leaving soils exposed and easily erodible by precipitation. In other cases, fires can cause soil surfaces to harden. Instead of gently percolating underground, rain water and melted snow can rush across these hardened surfaces, gaining enough power to erode loose sediments. Sankey and his colleagues wanted to estimate how projected increases in wildfires would change erosion throughout the West between the start of the 21st century and 2050 — the first assessment of fire-induced erosion, said Sankey…. The amount of sediment entering creeks after fires increased with the proportion of the watershed that was burned and if the area burned repeatedly, said Sankey. All that extra dirt can reduce water quality. Soils contain minerals, nutrients and metals, often considered toxic if consumed in large quantities by humans or fish. Large loads of sediment can even dam rivers, changing the course of a creek through its valley. And if the sediment settles in a reservoir, the reservoir will fill with dirt instead of water, severely shortening the lifespan of the water reserve. Restoring forests and improving water quality for human consumption or stream habitat for aquatic animals after a fire is costly, said Sankey, but it may be something water municipalities in the west need to prepare for. In the future, other members of the research team who are co-authors on the study with Sankey will use the erosion results to identify specific communities or watersheds that will be the most prone to fire-induced erosion in the future.